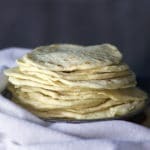 After 20 years of making what I thought were the best homemade tortillas, this all-butter recipe made me realize that sometimes really good things can get even better. Add the flour, salt and baking powder to the bowl of a standing mixer fitted with the dough hook, and stir to combine. Dump the dough out onto a work surface and divide it into 20 balls of dough. Cover the balls of dough with plastic wrap and let rest on the counter for 30 minutes to 1 hour. Lift the rolled out tortilla and place it in the center of the hot pan. Let the tortilla cook on one side until brown spots begin to form here and there on the surface of the tortilla that’s touching the pan, about 20 seconds. Use a spatula to flip the tortilla to the other side and cook until a few brown spots appear on the other side, about 10-20 seconds. Use the spatula to remove the tortilla from the pan to cool on a wire rack. Repeat with the remaining balls of dough. Tortilla dough should be soft and slightly sticky, but not wet. If you’re using a standing mixer, you want the dough to clean the sides of the bowl, but stick slightly to the bottom. The amount of water you’ll need to achieve this consistency will vary based on climate, humidity, temperature, and who knows what other factors. Start with the amount in the recipe and then add more as the dough kneads, 1 teaspoon at a time, until you have a soft, smooth dough that clings to the bottom of the bowl while sweeping cleanly along the sides. If at any point you find that you’ve added too much water, just add a bit more flour. If kneading the dough by hand, follow the instructions below using your hands to bring all the ingredients together inside a large bowl. Dump onto a lightly floured work surface and knead for 2-5 minutes until you have a smooth, soft dough. Adjust the heat of the pan as necessary if the tortillas start to cook too quickly and burn spots appear instead of the lovely brown spots.